Apple's follow up to OS X 10.9 Mavericks, will be OS X Yosemite, following with the theme of naming OS versions after impressive California landmarks. Last year's WWDC was all about giving iOS an overhaul. This year's star will be Apple's desktop operating system. Here's what you need to know. As we suspected, the new OS borrows much from iOS 7's flat design in its iconography. Additionally, Apple's designers have borrowed from the translucent designs, which Apple is cleverly calling "materials." Apple's notification center is getting a nice tweak, incorporating much of what you used to see in widgets before, including your calendar at a glance and useful information like the weather. This is nice streamlining of information and tools you used to have to go to different parts of the OS X UI for. Now firing up Spotlight opens a search window smack in the middle of your screen rather than on the right, and it's a much more fully featured search than before. Besides searching your files and calendar, Spotlight will now display results from the App Store, Wikipedia, Maps, Bing, iTunes, and iBooks. iCloud is now getting much simpler integration into the desktop UI with what Apple is calling iCloud Drive. Now you can view the files in your iCloud directly in a Finder. It basically looks like Dropbox except for your iCloud. Finally. Apple Mail has long lagged behind the competition. For the new version, Apple has streamlined the UI and created Mail Drop, a new feature for sending attachments that are too big for ordinary email. Rather than bouncing the file and message back, Apple creates a new message secure link so that your recipient can download it. Safari, like a few other core OS X applications, has been crazy out of date for years. It's getting a much more stripped down design. In its most basic view there's almost nothing beside the webpage you're looking at. Apple also claims it's made huge improvements to Safari's speed. Apple claims it loads JavasScript more than 6x faster than Firefox and Chrome. It also claims that that Safari's multi-tab support runs much more efficiently than the competition. Mail is getting Skitch-like image editing called, appropriately enough, "Markup." It allows you to draw, write, add text bubbles, etc. Bye Skitch! Now, one of the key questions about the melding between iOS and OS has been how are they going to work together. We know that the designs are going to be the same, but how will working on your iPhone or iPad transition seamlessly to working on your iMac. That's what Handoff is all about. Handoff could be the linchpin for the whole iOS-OS X merger because it seems so darn slick. In short, it allows you to start an activity on one device and then pick it up on another. In the perfect example, you might start banging out an email on your phone and realize you need to type to get your thoughts across properly. 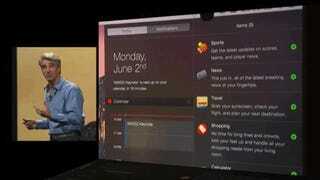 Your Mac will be aware that you've been using your phone and you can pick up the message there. The transitions work in the other direction as well. Your Mac will also be able to use your phone as a hotspot much easier than before, making it as easy as connecting to a MiFi, according to Apple. As we suspected, OS X Yosemite brings some of the biggest design and functionality changes we've seen in a long time, most of all when it comes to the operating system's aesthetics. Though it's not quite a full integration of the mobile and desktop platforms, it's certainly a big step in that direction. Apple's also taking a shot at a lot of competitor services like Skitch, Evernote, large file transfer services like Hightail, and others. 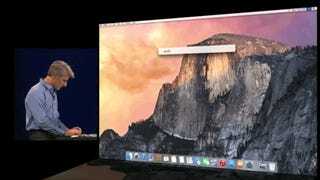 We'll have to wait until the OS drops to see if Yosemite is as big a change as we think.